When I was growing up, I think we had enough birds to border on hoarding. We had over 100, although most of that was little birds like parakeets. But still, I can't imagine what our neighbors thought. No risk of that for me! I feel like a toddler, three cockatiels, and a Boston Terrier are plenty! Wow, that's a lot of birds, even if they were all parakeets. I'm like you - my three are more than enough for me! Unfortunately, the rescues are starting to behave more like hoarders. They make it insanely difficult to adopt sometimes. 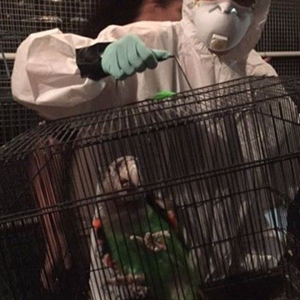 (they also fail on occasion like the one in Canada) There was a hoarding situation in Dakalb Co Georgia recently but luckily Ziggy's Parrot rescue swooped in. (sarcasm) The first rule with that rescue is that the parrot has to "like you" before you are allowed to adopt. That at least insures that the rescue birds have plenty of people visiting, hoping that someone will interpret some parrot behavior as "liking." LOL I just found your blog. Like it. Yes, I know a lot of rescues are in over their heads. I guess we all need to be more vigilant and volunteer to help more.